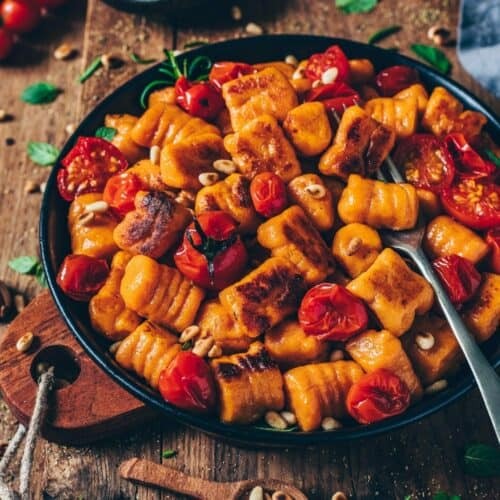 The best recipe for Vegan Sweet Potato Gnocchi with only 3 ingredients. It’s so easy to make, gluten-free and incredibly delicious! Serve them crispy pan-fried with oven roasted tomatoes for a perfect comfort meal! 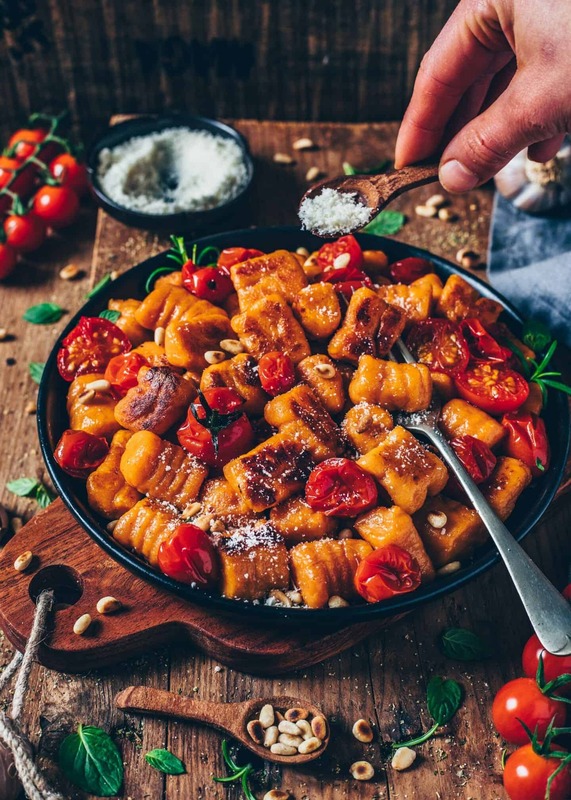 Is there anything more heavenly than enjoying some delicious Gnocchi that are crispy on the outside and soft on the inside? 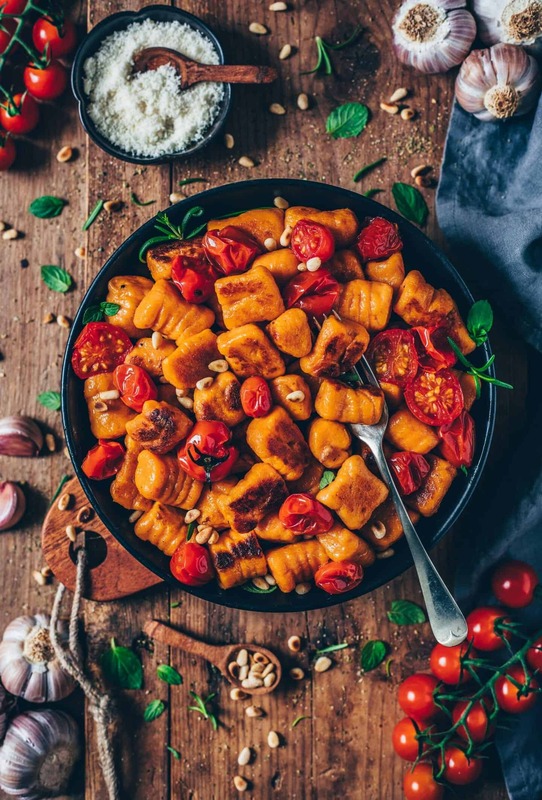 This Vegan Sweet Potato Gnocchi served with flavorful roasted tomatoes and dairy-free parmesan cheese is the ultimate comfort food! I absolutely love making them for lunch or dinner or as a simple side dish. 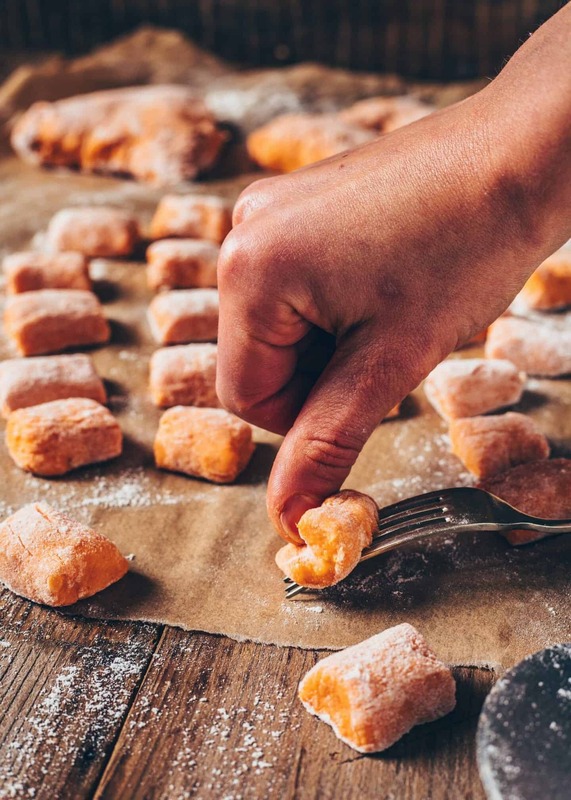 Gnocchi is also a perfect food you can make ahead and freeze in batches, so you can have homemade gnocchi any time you want! I’ve always been a big fan of dumplings, such as Ravioli, Pierogi and Gnocchi. When I was a child my grandma made potato dumplings every Sunday for the whole family. It was kind of our family tradition and everyone was looking forward to this special day over and over again. We loved sitting together while enjoying these delicious pillowy potato dumplings. For some reason, we always made Gnocchi with regular potatoes but today I want to show you another version made of sweet potatoes instead. 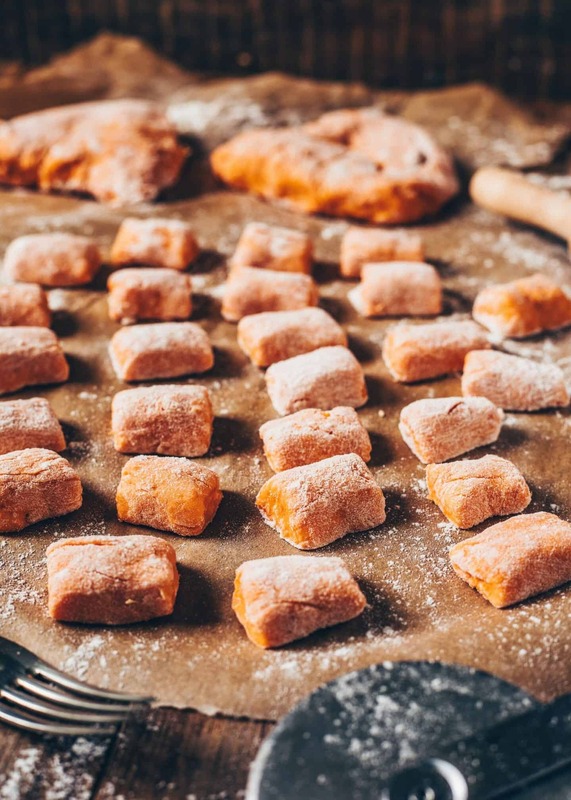 Making gnocchi with sweet potatoes is easier than you might think. First, microwave or bake a pierced sweet potato until soft. 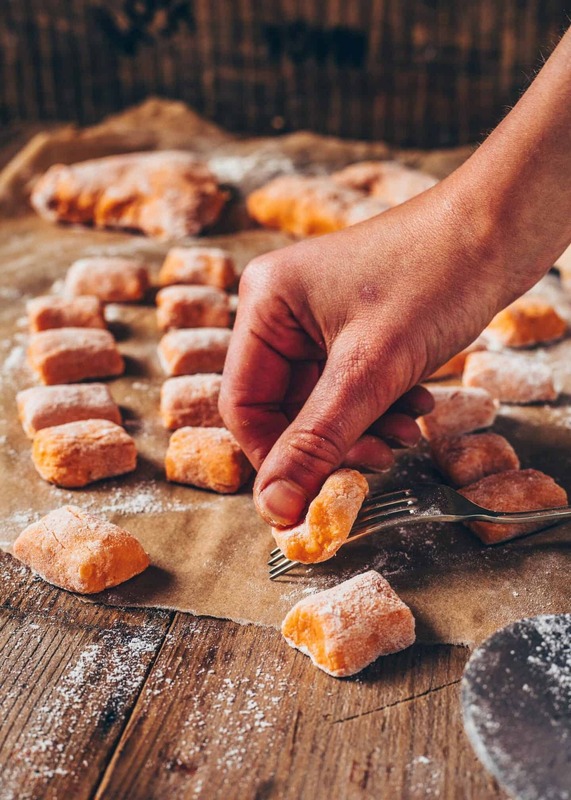 Once the sweet potato is cool enough to be handled, start making the gnocchi because the hotter potato will require less flour, making a lighter gnocchi. Peel the hot potato and mash. Add flour, nutritional yeast (optional) and a pinch of salt. Knead just until a dough forms but please do not over knead it, or the dough will get sticky and you have to add more flour. It’s just that, the more flour you have in your gnocchi, the denser. So the goal is to use as little flour as possible. 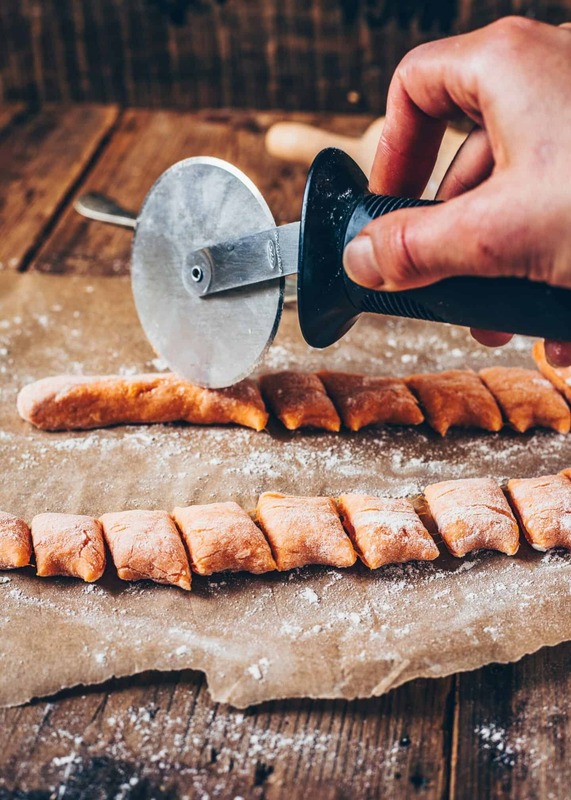 First of all, on a floured surface roll out the dough into logs about 2cm (3/4 inch) thick and cut them into pieces. You can either cook them this way or create the distinctive ridges. Place the gnocchi at the top of the fork tines and gently press down, rolling it across the fork with your thumb. It will be slightly curled with the indentations on the opposite side. 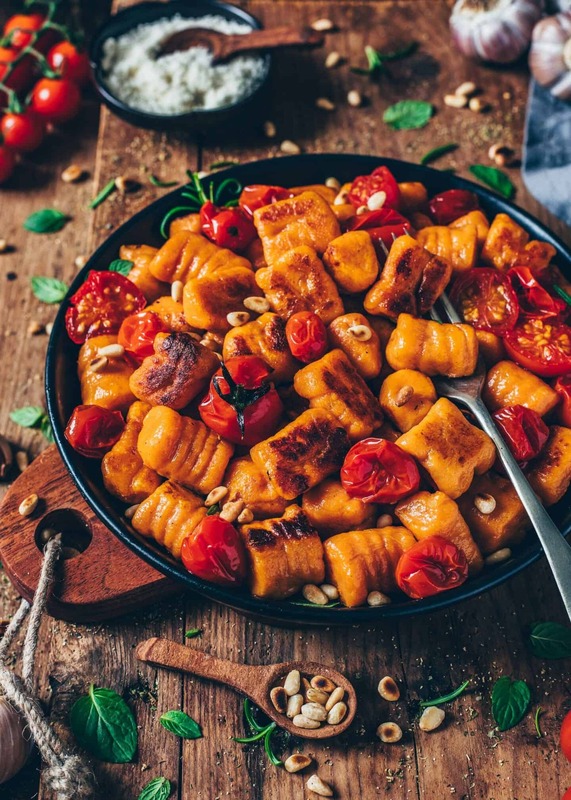 To cook the sweet potato gnocchi, bring a large pot of salted water to a boil and add the gnocchi. As soon as the gnocchi start floating, they are ready (usually it takes 2-3 minutes). Remove them with a slotted spoon and put them in the pan with the sauce/ pesto of your choice, or roast them crispy in vegan butter and serve with your favorite vegetables. They taste also very delicious then served with my Vegan Mac and Cheese sauce. If you‘d like to make gnocchi ahead, you can refrigerate the uncooked gnocchi in an airtight container. 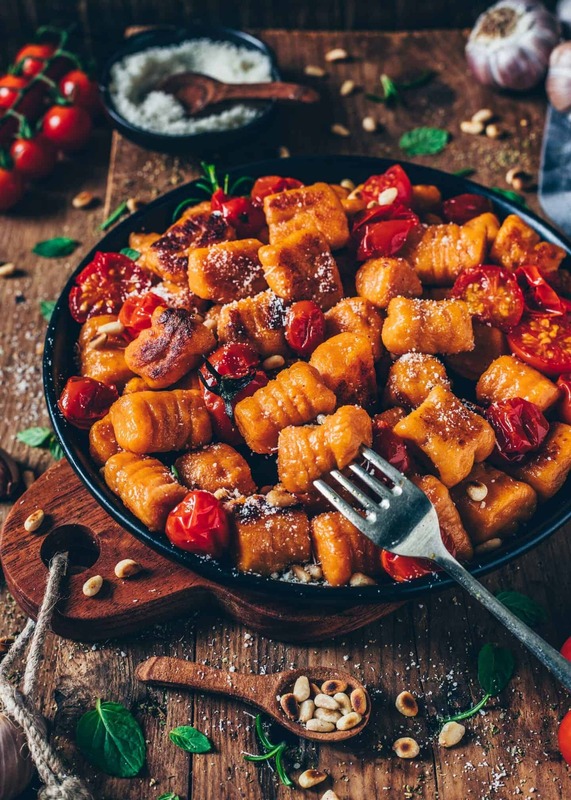 When ready to serve, simply boil the gnocchi according to the recipe below. Feel free to double the amount of the recipe to make more gnocchi, because they freeze very well. You can spread them in a single layer on a floured baking sheet or freezing box so they don’t stick together. Put it into the freezer for 1 hour or so. Once frozen, you can put the gnocchi into a freezer bag to save room. To cook them, just drop the frozen gnocchi directly in the boiling water without defrosting. Prick the sweet potato a few times with a fork and microwave until soft, for 7-10 minutes. (Optionally, bake the sweet potato in the oven for about 50-60 minutes). Peel the sweet potato, scoop the flesh into a bowl and mash until smooth. Add nutritional yeast/ parmesan + salt and mix until combined. Add the flour and knead gently but don’t over knead it or the dough will get sticky. Add more flour if needed but try to add as little as possible to get fluffy and soft gnocchi. 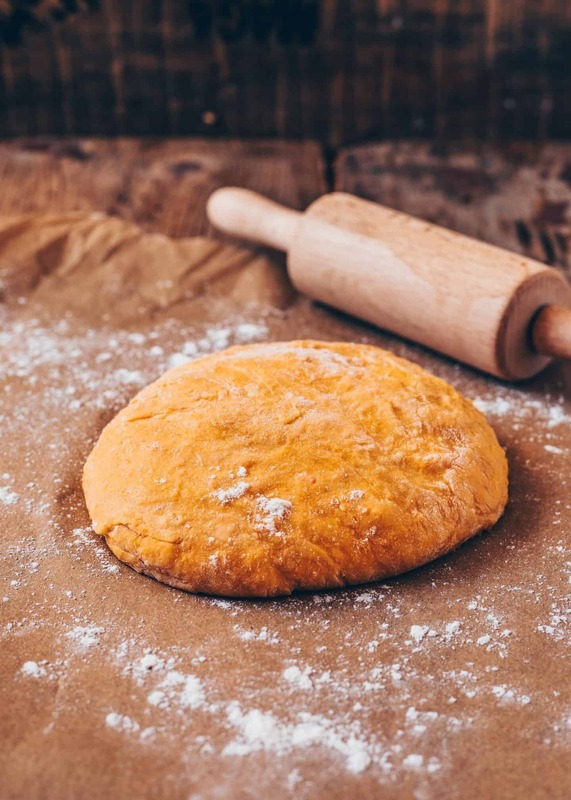 Transfer the dough to a floured working surface, form it into a flat ball and cut into quarters. Take a piece and form a long rope, rolling it along your floured surface. Cut the rope into 3/4-inch (2 cm) pieces and either cook them this way or create the distinctive ridges. 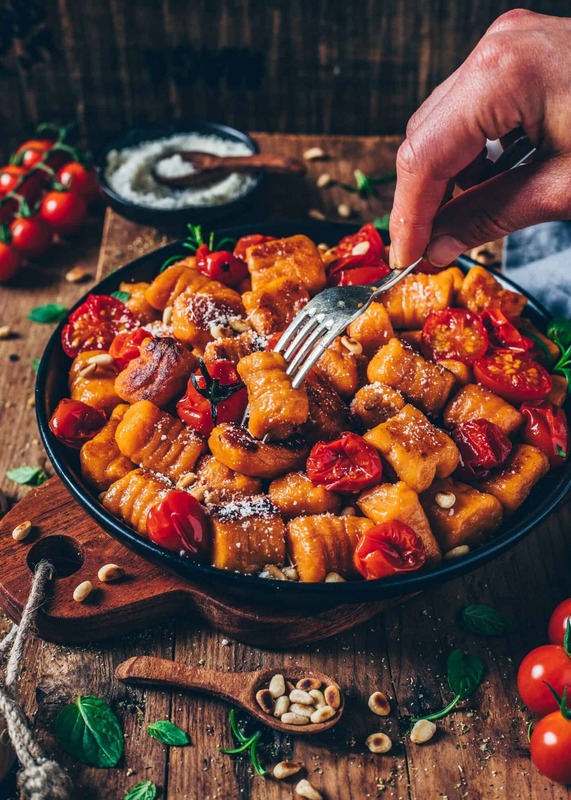 To create the typical gnocchi ridges, place the gnocchi at the top of the fork tines and gently press down, rolling it across the fork with your thumb (see pictures in the text above). Bring a large pot of salted water to the boil, add the gnocchi, and cook until the gnocchi float to the top of the water. Drain and optionally, toss with a little olive oil to prevent sticking. 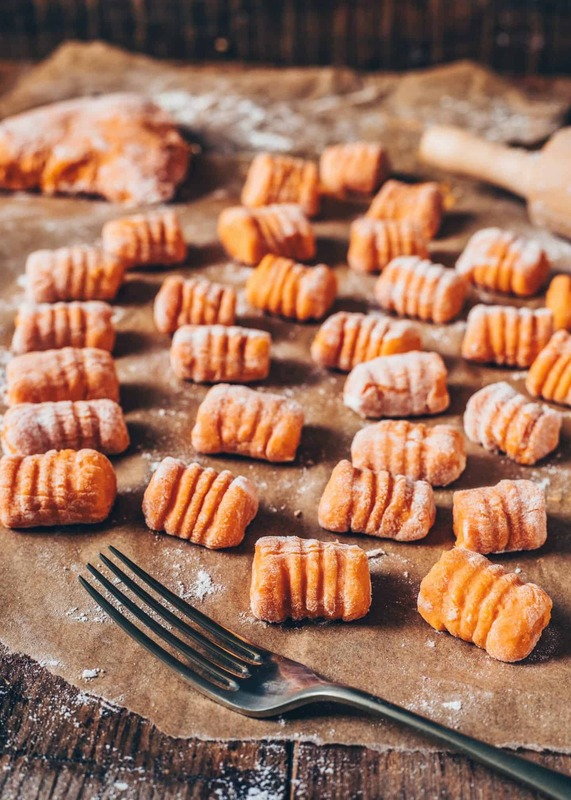 Now you can continue making the recipe to serve them immediately, or refrigerate the gnocchi to serve them later, or freeze them for further meals. Put the tomatoes onto a baking sheet or baking dish. Drizzle with olive oil and sprinkle garlic cloves throughout. Season with a little salt & pepper and toss to coat. Spread out into a single layer and roast in a preheated oven at 400°F (200°C) for 15-20 minutes. Toast pine nuts in a small pan without additional oil. Then set aside. Heat the butter in a large skillet over medium heat until lightly bubbling. Add the gnocchi and roast until golden-brown and crispy on the outside. Season with salt and pepper to taste. 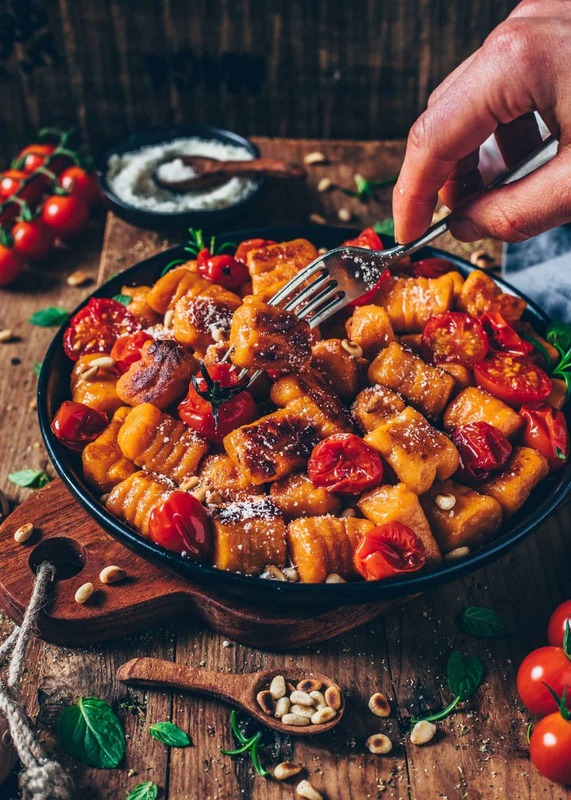 Serve your crispy Gnocchi with roasted tomatoes and toasted pine nuts and sprinkle over vegan parmesan cheese and fresh chopped herbs, if you like. 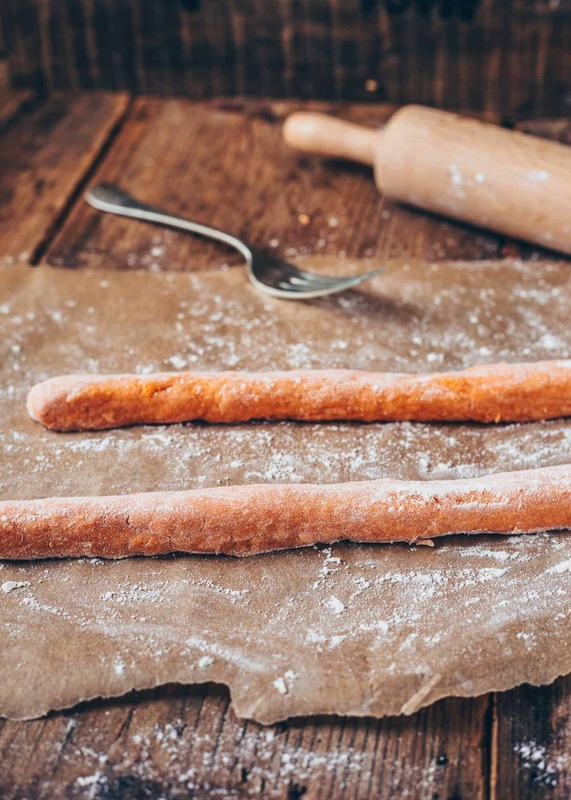 You can use regular wheat flour or a gluten-free flour blend. Water will absorb more flour, resulting in a denser gnocchi. So please do not boil the sweet potato. You can find suggestions about the storage etc. in the text above. Thank you for your kind comment! Have fun trying the recipe. Made this on Monday and again yesterday by request! Easy to make and absolutely delicious, I added a dash of nutmeg and served it with a fresh tomato sauce. Love that the nutritional yeast adds some extra protein for my vegan family members. Made this recipe already 3 times! I sooo loved it! Very easy to make and absolutely delicious! Thank you so much! Love this recipe! Making gnocchi can be intimidating, but this was super easy and delicious! I made it and it was delicious, but the gnocchi started to dissolve when I boiled them, as soon as I put them in the water. Any tips for me? So glad that you liked the gnocchi! It never happened to me, so I don’t know what you did wrong. Did you add vegan parmesan cheese? Maybe this would help the gnocchi to hold together. Try using cold potatoes instead of warm ones! Works way better! Super easy to make and absolutely delicious! Definitely a new dinner staple! Thank you! The photographs showing the technique are especially good and clear, as are the instructions. I look forward to trying this, and will be checking out your other recipes as well! OMG!! I’m so in love with this recipe! 😍 So tasty and beautiful 🤤 Actually I’m in love with all your recipes to be honest. I want to make all of them 😄 You’re an artist!!! From your recipes to your pictures!!! I did the gnocchis yesterday and they turned out super amazing! 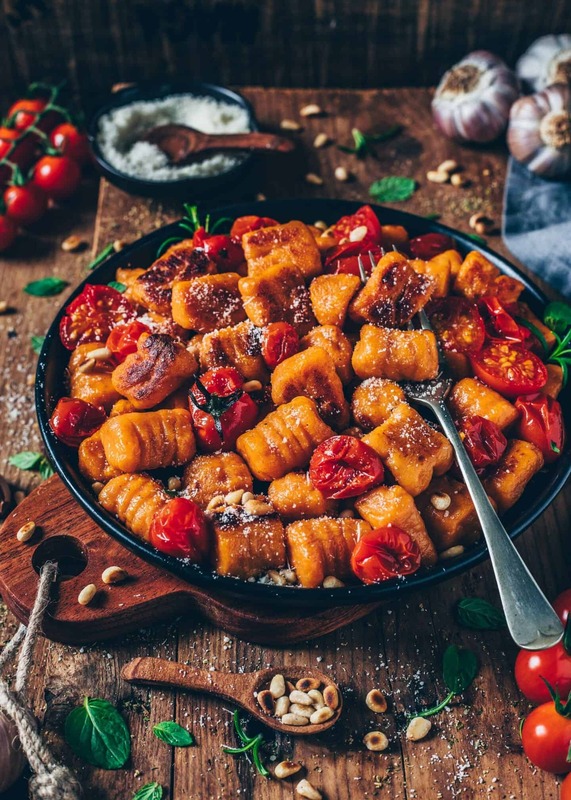 I tried this recipe and it turned out very good, but I have just one tip for all of you – if you wait until the sweet potatoes are cold, the gnocchi dough would be easier to cope with and gnocchi would be softer! According to my grandmother, you always have to use cold potatoes and it works a lot better! I‘ll try your tip next time too. 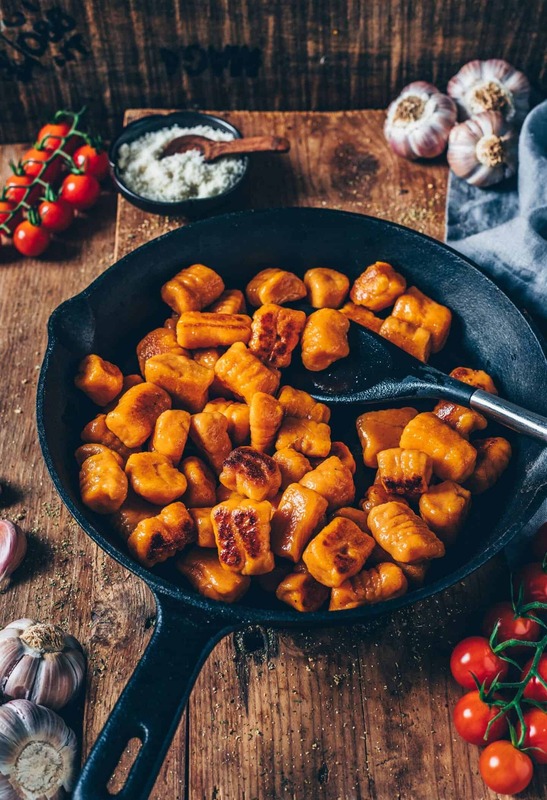 I made the sweet potato gnocchi, inspired by your recipe. Made them with some corn flour and sage. Served with a creamy cashew tomato sauce. Thanks a lot for all your great Vegan recipes!! Very yummy! I used a gluten free flour and they turned out good, not quite as pretty but still yummy. Definitely recommend pan searing them. The flavor and texture from roasting was perfect. I LOVE roasting them! It’s so delicious. So happy you liked this recipe too 🙂 Thank you! Can I make this recipe with regular flour?? I made this gnocchi yesterday. As we have no microwave we put the sweetpotato in the oven. It took longer than 60 min but that was fine. All in all it was really delicious. And I am a sucker for any type of sauce but I didnt need any. 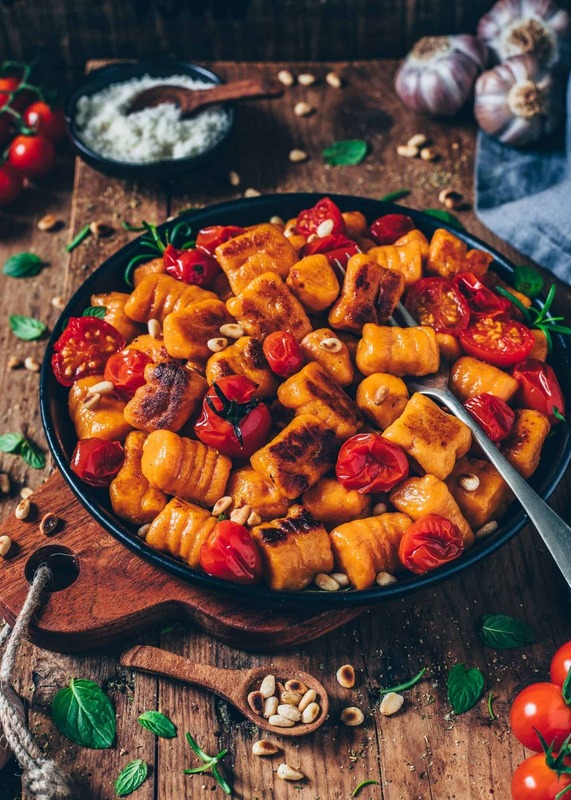 Loved the Sweet Potato Gnocchi recipe! I am an avid cook and don’t mind complex recipes, but I was pleasantly surprised at how simple this was! Very tasty. Normal gnocchi has a slightly bitter after taste, but the sweet potato made this very gentle on the palate. I will be using this recipe again. Thank you Bianca! -Francesca H 🙂 P.S. bacon adds a very flavorful touch with either fresh basil or even cilantro as a garnish. This recipe was so easy and delish! Definitely making again!